Lenormand is a diviner’s revelation. An oracle system reuniting quintessential and universal archetypes and symbols in such a brilliant and comprehensive manner that no stone remains unturned when we want to understand and predict quotidian real life events and psychological energies behind all actions. 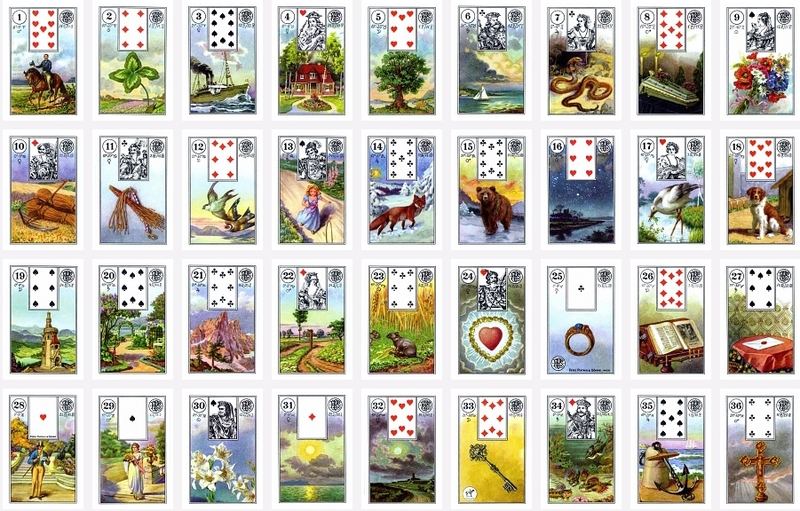 Although named after famous cartomancer and author Marie Anne Adelaide Lenormand, who apparently was the diviner of Empress Josephine and the French and Russian court during the Napoleonic era, the actual author of the Lenormand system is unknown at this point, and the oracle strongly looks like the result of a long-term collective effort, a truly eclectic deck, with on ongoing adaptation to our lives (let’s consider for a moment the card of Stars, for instance, and how nowadays it signifies internet connections), the epitome of modernism in cartomancy. The exact birth of Lenormand is still under study, but it seems to originate or be related to the Piquet, Hechtel’s Game of Hope, Italian game Biribissi and the Coffee Cards, where similar symbols can be found (Moon, Sun, Dog, Scythe etc.) as mentioned by Mary K. Greer and Caitlin Matthews. What I work with is the Petit Lenormand, but the first deck called Lenormand is the Grand Jeu de Mlle. Lenormand, published by Grimaud in 1845, two years after Madame’s Lenormand death, a 54-cards system, fairly different than the Petit Lenormand, which is the deck most professional lenormandists use. This is the cartomancy oracle we are talking about, a 36-card deck comprising of a set of daily life symbols which are at the same time an essential and comprehensive symbolistical pack. 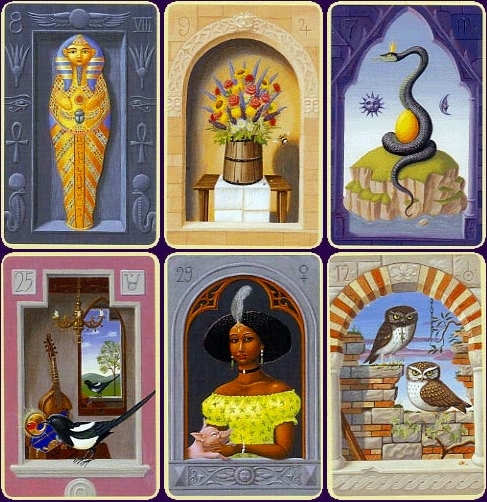 Each card corresponds to a cartomancy suit (although the classic cartomancy meaning seems to have been lost for most cards, with the exception of court cards) and an astrological correspondence, recently added. Each of the cards is rich in mundane, psychological and esoteric symbolism and together they form sentences able to describe and predict everything. I currently use the Mystical Lenormand, a very beautiful and insightful deck created by Regula Elizabeth Fiechter and artist Urban Trosch and one reason I use them is the rich esoteric symbolism integrated in the cards imagery. "Combining the cards and their symbols in pairs will form a sentence or a message, much like reading hieroglyphics. Every symbol has many layers of meanings, and the appropriate meaning will depend on the context of the question, the adjacent symbols, and the reader’s own insights. These symbols work in tandem to reveal truths, secrets, and events around us."